When you think of racehorses, it is the Thoroughbred that immediately comes to mind. They race daily at tracks around the world. The Thoroughbred was originally bred in England due to the Englishmen's emerging passion for fast race-horses. Three that founded the Thoroughbred bloodline were Byerley Turk, Darley Arabian, and Godolphin Arabian, all imported to England between 1670 and 1710. About 90% of modern Thoroughbreds have descended from Eclipse (his grandsire was Darley Arabian), who was never beaten in 18 races. Another descendant of Darley Arabian was Diomed, who won the first running of the Derby, held in 1780. At 21 years old, he was sent to the United States, where he founded the male line through his son, Sir Archie. Thoroughbreds are the horse of choice for track racing, the best known race being the Kentucky Derby. 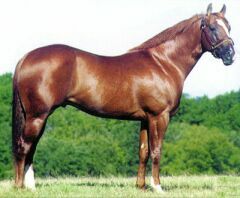 The Thoroughbred has also had influence on other breeds such as the American Standardbred, the popular choice for harness racing. In fact, many of the world's horse breeds have benefited at some time from the addition of Thoroughbred blood. Thoroughbreds in America are born in the spring, but regardless of the actual date, January 1st is their official birthday. Having spent its first year developing size and power, the young Thoroughbred begins training as a yearling. The animal learns to accept a saddle and bridle, a rider on its back and ultimately to break from a starting gate and run around a track. Kentucky has more Thoroughbred horse farms than anywhere else in the world. Most of the racetrack champions come from Kentucky. Read the next horse breeds article on Miniature Horses.